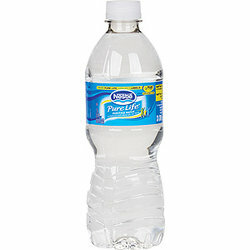 Nestle Pure Life Bottled Water 16.9 oz - Case of 24. An incredible value in the bottled water category. Each case contains 24 bottles with 16.9 oz (.5L) of Nestle Pure Life Water. From Nestle Pure Life site: Every drop of water in every bottle of Nestlé® Pure Life® Purified Water goes through a multi step process of filtration that involves reverse osmosis and/or distillation. We then enhance the water with a unique blend of minerals for great taste.